THE MOST eagerly anticipated work of American literature has finally been published, albeit with a few parts missing, which only make it seem more tantalising. Robert Mueller’s report has been downloaded almost 100,000 times from government websites. Many more people will have looked at copies emailed by friends or hosted on media websites. The interest in a government report more than 400 pages long is understandable. Mr Mueller spent nearly two years investigating links between the Russian government and President Donald Trump’s campaign. Last month the attorney-general, William Barr, released a four-page summary, stating that the report did not establish that anyone involved with Mr Trump’s campaign “conspired or co-ordinated with Russia” in its election-interference efforts, nor did it establish that Mr Trump committed obstruction of justice. Mr Trump treated that summary as dispositive. No collusion, no obstruction, “Complete and Total EXONERATION,” as he tweeted. The full report paints a different picture. The first 170 pages concern Russia. They begin by laying out the scope of Russia’s influence operation. Some of this may be familiar to those who perused two previous indictments issued by Mr Mueller’s team. One was against members of the GRU, Russia’s military-intelligence agency, who hacked into and stole emails from servers belonging to the Democratic Party and to people working for Hillary Clinton’s campaign. The other was against the Internet Research Agency (IRA), a Russian troll farm run by a Russian businessman closely linked to Vladimir Putin, which engaged in a social-media campaign to sow discord and damage Mrs Clinton’s campaign. 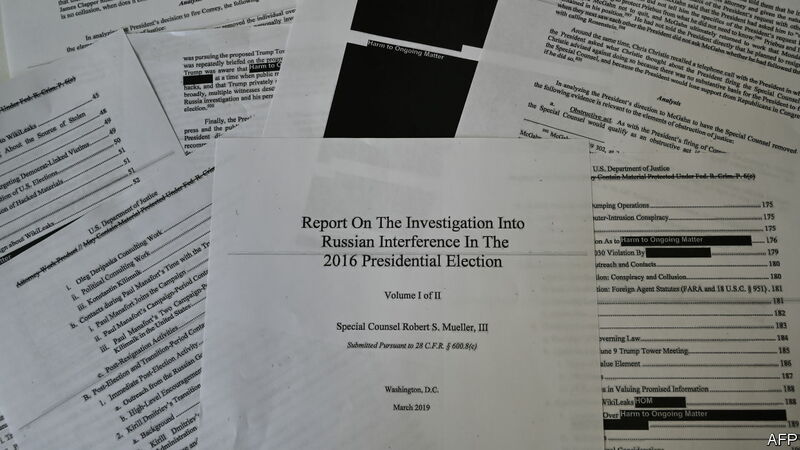 Though Americans have understandably been focused on the evidence about whether the president was complicit in a foreign power’s attempt to sway the election, this part of the report is arguably the most important part from the point of view of protecting future elections. Unfortunately, America’s deep political divisions are all too easy to exploit. IRA staff sitting in St Petersburg (the one on the Neva rather than on Tampa Bay) pretended to be Americans on social media and staked out divisive positions on either end of the political spectrum, passing themselves off as supporters of Mr Trump, or of Black Lives Matter. The outfit also organised multiple real-world events, starting with a “confederate rally” in Houston in late 2015, as well as several pro-Trump rallies in Florida, New York and Pennsylvania (a state that Mr Trump won narrowly and unexpectedly). Some rallies, the report explains, drew few attendees; others drew hundreds. Candidate Trump pointed to one event organised by the IRA in Florida as evidence of his popularity there. This judgment turns on the absence of any agreement, explicit or implicit, between the parties to conspire, which seems fair. Nevertheless, the enthusiasm of Trump campaign members for working with people with ties to a government that kills journalists, imprisons political rivals and had recently pulled off the first land grab in Europe since the second world war, is quite something to see when it is all put in the same place. Paul Manafort, Mr Trump’s campaign chair, who was deep in debt to a Russian oligarch, shared internal polling data with Konstantin Kilimnik, one of his Kiev-based employees with apparent links to both that oligarch and Russian intelligence. Even Rick Gates, Mr Manafort’s right-hand man, believed Mr Kilimnik was a “spy”. That did not stop Mr Manafort from meeting Mr Kilimnik. George Papadopoulos, a junior foreign-policy advisor who pleaded guilty to lying to federal investigators, tried to let the campaign know early on that the Russians had compromising material on Mrs Clinton (nobody thought to tell the FBI). Donald Trump junior arranged a meeting with a Russian lawyer who promised “dirt” on Mrs Clinton. And of course Mr Trump himself was pursuing a Trump Tower Moscow project until just five months before the election, while simultaneously pushing for better relations with Moscow. None of this may have been illegal, but had voters known about it they might have made a different choice. Sustaining an obstruction charge requires three things: an obstructive act, a connection between that act and an actual or contemplated criminal proceeding, and corrupt intent. Mr Mueller comes closest to accusing Mr Trump of meeting those three conditions in the firing of James Comey, a former FBI director, six days after Mr Comey declined to publicly state that Mr Trump was not personally under investigation. Afterwards he told the Russian foreign minister, “I faced great pressure because of Russia. That’s taken off.” That could be an obstructive act because, although it did not stop the investigation into his campaign’s links with Russia, it could affect how Mr Comey’s successor conducted that investigation. But Mr Mueller leaves open whether Mr Trump’s motive was a desire to impede the investigation, or simple anger that a subordinate failed to do as told. The striking thing about this section, when read in full, is how self-wounding Mr Trump’s behaviour has been. Had he simply kept quiet, and let Mr Mueller complete his investigation into his campaign’s links into Russia, the obstruction investigation never would have happened. Instead, he interfered clumsily on many occasions, allowing the special counsel to amass a damning record of the president’s truculence, dishonesty and contempt for federal investigators. It seems unlikely that Congress will do so: the Democratic leadership in the House has sensibly concluded that impeachment proceedings could backfire politically. There is nothing in the new report that will suddenly persuade Republicans in the Senate to abandon the president. It is nonetheless an extraordinary document. PREGNANT WOMEN have limited mobility. That is obvious to anyone who has had a baby, but didn’t occur to the founders of Google when they designed their car park. When Sheryl Sandberg, then head of online sales, became pregnant in 2004, she made a simple request: parking spaces for expectant women as close to the building entrance as possible. That is just one example of how many aspects of the workplace lack the female perspective. In her brilliant book “Invisible Women: Exposing Data Bias In A World Designed For Men”, Caroline Criado Perez shows how widespread these subtle biases can be. It starts at the recruitment stage. Women are put off from applying for jobs that use words in their adverts such as “aggressive” or “ambitious”. When one company changed its ad to focus on qualities such as enthusiasm and innovation, and used a photo of a woman rather than a man, the proportion of female applicants rose from 5% to 40%. Once you have a job, you must get to the office. Because they often care for children or elderly relatives, women are likelier to make multiple journeys. Those who use public transport often need radial routes whereas most systems favour commuters heading from the suburb to the centre of town. This means female journeys can be much longer than male ones, making it difficult for them to get to work on time. Women experience more work-related stress than men, according to research by Britain’s Health and Safety Executive, and face a particular problem with long working hours. But a study found that unencumbered people of both sexes (those with few or no caring responsibilities) could cope equally well with a 48-hour week. The stress occurred because women struggled to combine their caring responsibilities with work, a problem faced by a smaller number of men. Those responsibilities may also mean that women find it more difficult to take part in after-work bonding activities like dinners, Ms Criado Perez argues. Many companies allow workers to put the cost of food and drink at such events on expenses, but not the cost of a babysitter. That is a problem for single parents, and women comprise 80% of that category in America and 90% in Britain. When their performance is reviewed, Ms Criado Perez argues that women are criticised for being bossy, abrasive or strident, whereas men are encouraged to be more aggressive. But if women are warm and friendly, they get criticised for being insufficiently professional. Women’s physical health, too, may be affected by male-dominated design. Their bodies absorb chemicals more quickly than men’s do. The long-term effects of inhaled particles on (mostly male) miners have been studied extensively; those of cleaning products on (mostly female) cleaners have not. In construction and engineering, tools and safety jackets are designed for male hands and bodies, not female ones. Bulletproof and stabproof jackets are also designed for men and thus do not fit women comfortably; a British police officer removed her jacket so she could use a hydraulic ram to enter a flat, only to be stabbed and killed. Many men do not realise there is a problem. Those who believe they are objective when recruiting are nevertheless more likely to hire another man than a woman with identical qualifications, as a paper from 2007 showed. A similar issue is apparent with race, as Jennifer Eberhardt, a professor at Stanford University, describes in her book “Biased: The New Science of Race and Inequality”. An American study showed that candidates with black-sounding names get fewer callbacks than those with traditional European names. Even highly qualified African-Americans received fewer calls for interview than whites with lesser qualifications. White people with a criminal record received as many callbacks from employers as black people who had never committed an offence. And this was true whether or not the company described itself as an “equal opportunity employer”. It is natural if you have succeeded in work to assume this was down to your own merits. But the existence of hidden biases shows that the playing field is not level. As both authors argue, preventing discrimination depends not on white men discovering their inner liberal but on decisions being taken by those with broader perspectives. If every executive carries a hammer, it might not occur to them that some jobs need a screwdriver.